The ISTE Teacher Standard 3 provides four benchmarks for modeling digital age work and learning. My focus is to “collaborate with students, peers, parents and community members using digital tools and resources to support student success and innovation” (ISTE 2016). How can I help the teachers at my school to begin building digital portfolios of student work, using the Seesaw digital portfolio platform? My school recently adopted the Seesaw student portfolio platform as a method for creating and sharing student portfolios in our K-8 construct. The plan is for teachers to to use Seesaw to begin to build portfolios for students in Kindergarten. As students progress through grades 1-8, they will learn how to add pieces to their own portfolios. Teachers will guide curation. Parents will be able to view and comment on their own child’s portfolio. In fact, Seesaw has a feature that automatically notifies a parent when a new piece has been added to their child’s portfolio. Additionally, other teachers/community members (including other students) can be allowed to view and comment on a child’s portfolio. My school’s pilot for the Seesaw platform is in grades K-5, with our Kindergarten and 2nd Grade teachers being the most successful users. In Kindergarten, the teachers capture student work and do the work of maintaining the portfolios and sharing with parents. In 2nd Grade, the teachers share the task of capturing learning artifacts with students. Our art teacher is maintaining separate Seesaw portfolios for students so that they can comment on each others’ work. According to the SAMR model, I believe this use of online student portfolios would fall under “redefinition” because the “tech acts as a direct tool substitute with functional improvement” (Puentedura). There are many ways to share and comment on student work; however, the technology provided by Seesaw allows for collection, sharing, and commenting to happen in a seamless and more efficient fashion. According to TPACK, this activity represents Technology Knowledge (TK), specifically, “knowledge about certain ways of thinking about, and working with technology, tools and resources. and working with technology can apply to all technology tools and resources. This includes understanding information technology broadly enough to apply it productively at work and in everyday life, being able to recognize when information technology can assist or impede the achievement of a goal, and being able continually adapt to changes in information technology” (Koehler & Mishra, 2009). Regardless of their comfort level with technology, all teachers at my school will need to learn how to use this tool. I wonder what support teachers, and eventually students, will need in order to create the successful scalability for this programmatic change. Seesaw has built-in scalability, in that a school account allows for automatic transfer of one class to the next grade level teacher. And yet, will Seesaw really remain in use for 9 years—the K-8 grade experience of our current Kindergarten class? Whether or not that is the case, and in the meantime, what are we teaching our students about this type of technology Nicole Krueger wrote, “No matter how quickly technology advances, it’s up to education leaders to keep an eye on the horizon. Those who play the long game already understand that to equip students for success in a digital world, schools need a commitment to innovation and the ability ride the waves of rapid change.” It is clear that the “long game” in this scenario refers to teachers and students using digital portfolios (Seesaw or other) to store and share work samples. Touching on digital citizenship, the NMC advised, “Teachers can also be proactive and inform their students about available resources to help make them more aware of their digital footprints as they explore the Internet.” My school currently uses Common Sense Media’s Digital Citizenship Curriculum, which has lessons about digital footprints at each grade level. Seesaw operates somewhat like the social media tools (Facebook, Twitter, Pinterest, Instagram, etc.) that our students will eventually use. We and they will upload photos, videos, text, etc. that will be viewed by other users (even if only their parents) and which will be stored on a server that they do not own. Because we are introducing this type of tool, it is our responsibility to make sure they understand their rights and responsibilities as users. 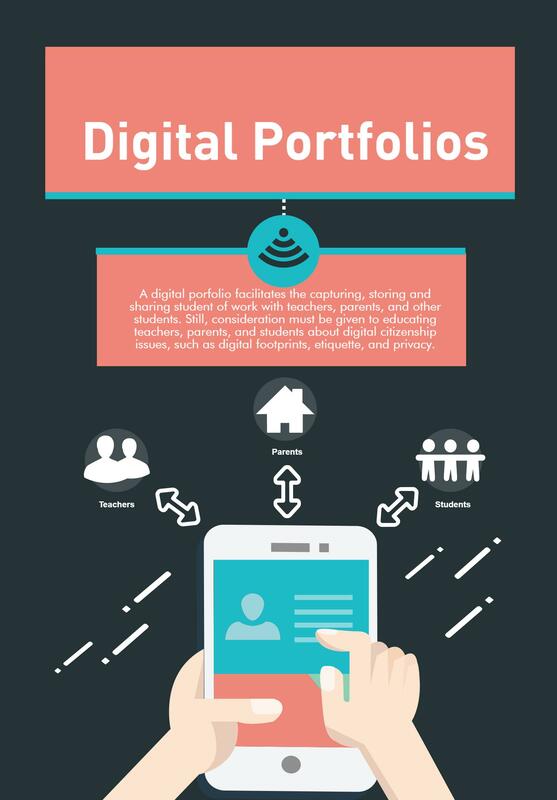 My final thought is that digital portfolio tools will be most powerful if they are used as a tool to create a larger audience for student work and to encourage student self-reflection on both individual pieces and entire bodies of work. The strength of digital portfolios is that they simplify the storage and sharing of student work. The potential is greater engagement and continuing conversation among teachers, parents, and students about the student’s work. If digital portfolios create a stronger communication network among teachers, parents and students over the course of a student’s entire (K-12) school experience, then this tool may go beyond simply achieving “functional improvement” and move into the realm of “redefinition” (SAMR). I can’t agree more. I think SeeSaw has a great potential to create greater engagement and continued conversation among teachers, parents, and students about the student’s work. SeeSaw takes the real timelessness of Class Dojo and makes it academic.